As noted by ZDNet, scammers have launched a new round of phishing emails on the heels of an outage of Apple's Developer Center late last week. 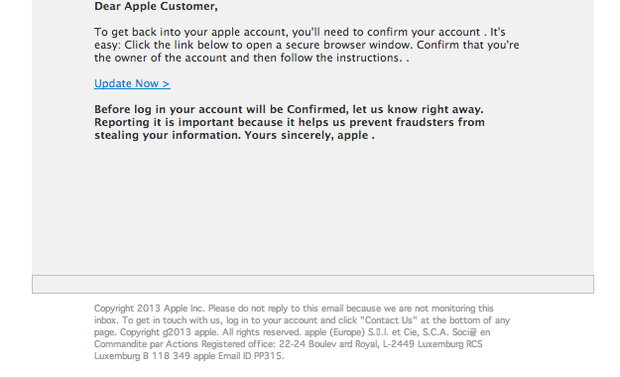 The email offers the recipient access back into their accounts if they click on a link posing as an official Apple page. However, the page is actually located on another site and proceeds to take the account credentials of the user if they log in on the page. Phishing attacks targeting Apple customers are regular occurrences given the size of the company's user base. But with many casual users perhaps only vaguely aware of Apple having had a recent problem with some of its online services, they may now be more likely to fall victim to such an attack. Earlier this week, independent security researcher Ibrahim Balic speculated that he may be responsible for the breach that caused the extended outage of Apple’s Developer Center, which for the most part remains offline one week after it was taken down by Apple. Yesterday, Apple outlined a plan for bringing its Developer Center back online, and also created a status page to display the availability of its services. Look at that grammar! Although it may look quite real, it reads like an 8 year old has written it. ...or someone for whom English is not a native language. If anyone actually falls for this, they should not be a Developer. Hmmm, have you seen any of the apps on the store?!? If anyone actually falls for this, they should not be a Developer. The grammar in this email is shocking. Apple don't address with "Dear Apple Customer" / Apple Don't use "to get back into your account" / Apple never use "update now" links, as Apple always shows the full link in emails / "Confirmed" should not be capitalised / Apple don't use the term "right away" / Apple don't use the term "fraudsters" (ironically the fraudsters are the one's sending these out) / And "yours sincerely, apple" - no capital A an no carriage return after "sincerely". Oh and the the way, where's the Apple Logo? So anyone to whom English is not their first language should not be an Apple developer? I've heard a theory (which might be plausible) that the spelling or grammar errors are deliberate, in order to weed out the careful/sceptical users right at the start. Anyone who doesn't notice the spelling/grammar/layout errors right at the start is more likely to give our their passwords/credit card details later. I was going to post the same thing and then saw your post hellomoto4. It reads terribly and you have to wonder at the literacy of the people who fall foul of these phishing attacks really. Go to a tech site and you will see 'Apple are' and 'Samsung don't'. Look at a legal document and you will see 'Apple is' and Samsung doesn't'. That's the difference between British and American English. Probably a lot of people too who've signed up as Apple devs just to get early access to iOS.